Southside Wheely Wheelers Wednesday Night Light Cycle restarted last Wednesday evening 12th January at 7pm, all cyclists meet at usual meeting place the Castle Car Park Kilmallock. All cyclists were well equipped with front and rear lights, hi-viz vests and bright clothing. The evening was exceptionally warm and a pleasant dry evening just perfect for night cycling. It has been a few weeks since our last Wednesday Night Light Cycle and it took a few laps of the Quarry Hill circuit to brush off the over eating during the Christmas break, but our club cyclists met the challenge of night cycling with every pedal stroke for ninety minutes of cycling. Out cycling were Paul Ahern, Adrian Gammell, Brendan Houlihan, Owen Tobin, John Swords, Paul Gammell, Jerry Ryan, Liam Carroll and Michael Reale. Well done. Wednesday Night Light Cycle 24th November was well attended on a very cold evening, after 2 laps of the Kilmallock Quarry Hill circuit, cyclists were warming up and highly motivated to take on the challenge of night cycling in freezing conditions. Road conditions were excellent and cyclists were well wrapped up and had a wheely enjoyable cycle for one hour twenty minutes, out cycling were Paul Ahern, Jerry Herbert, Sean Burchill, Daithi Creedon, Adrian Gammell, Brendan Houlihan, Owen Tobin, Paul McCarthy, John Swords, Ber Gammell, Paul Gammell, Liam Carroll, Michelle Gammell, Michael Reale. Well done night riders. Wednesday Night Light Cycle 17th November 7pm was well attended by club cyclists enjoying the night cycle. The evening was cold but rain stopped just in time for the start of the cycle and it was perfect conditions for the cyclists to enjoy the mid-week cycle. With full front lights on and flashing red rear lights, wearing hi-viz jackets, the cyclists took off in to the night. Cyclists have adapted well to night cycling and look forward to getting out mid-week on the bike. Out cycling were Paul Ahern, Sean Burchill, Liam Carroll, Daithi Creedon, John Swords, Brendan Houlihan, Paul Gammell. Remember to take your bicycle home with you after the cycle. 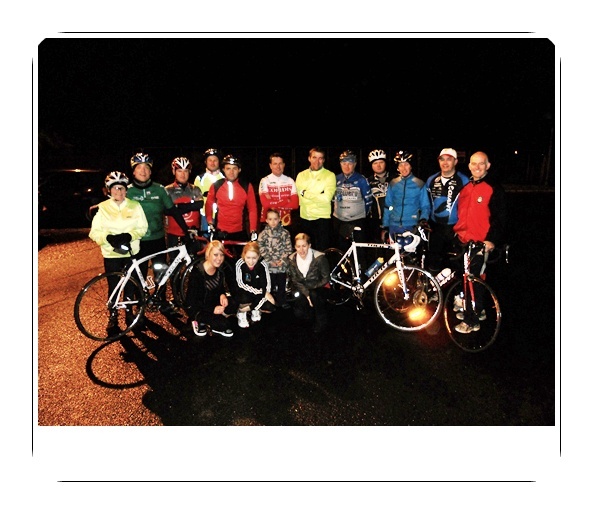 Twelve enthusiastic cyclists met at 7pm evening 27th October 2010 at the Kilmallock Castle Car Park. 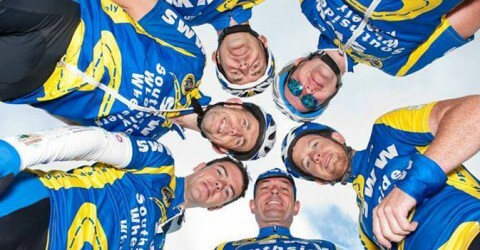 Photographer for the Limerick Leader Newspaper met the cyclists for a quick photograph that will be in next weeks paper. With full front lights on and flashing red rear lights including hi-viz jackets, flashing helmet lights the cyclists took off in to the darkness. The evening started dry but soon rain fell but this did not dampen their spirits as they cyclised along in a leisurely pace. The roads around Kilmallock were extra busy due to a local funeral but approaching cars slowed down some what confused by the cyclists unusual lights on their bikes. Thank you all for making the cycle such an enjoyable evening. Wednesday Night Light Cycle started at 6.30pm this Wednesday 20th Oct 2010 with eight cyclists taking on the new challenge of night cycling. Armed with Hi-Viz jackets, high beam front lights, flashing rear lights on the back of their bicycles, flashing lights on helmets the cyclists full of enthusiasm headed off on three different circuits. Cycling in the dark evening offers a unique way of cycling and after a few miles or should I say kilometres the cyclists got sensitised the night light. Special thanks to the local County Council for completing roadwork’s on the quarry hill circuit as promised when asked to make the circuit safe for the Wednesday Night Light Cycle. All cyclists were very happy with over a hour and a half cycle and an enjoyable way to break the week of dark winter evenings. Special thank you to all cyclists who cycled an had a Wheely good time. cycling helmet, lights and hi-viz vest. Paul Ahern, Jerry Herbert, Sean Burchill, Daithi Creedon, Adrian Gammell, Brendan Houlihan, Owen Tobin, Paul McCarthy, John Swords, Ber Gammell, Paul Gammell, Liam Carroll, Michelle Gammell, Michael Reale. WELL DONE. Wednesday Night Cycle was very enjoyable on a cold but dry evening. Armed with Hi-Viz jackets, high beam front lights, flashing rear lights on the back of their bicycles, flashing lights on helmets the cyclists wheely enjoyed an hour and a half of night cycling. It is great to get out on the bike mid week to keep fit. Out night cycling were Paul Ahern, Adrian Gammell, Brendan Houlihan, Jerry Herbert, Sean Burchill, Daithi Creedon, Phyllis Richardson, Ber Gammell, Michelle Gammell, Jerry Ryan, Paul Gammell.